We’ll be at RampUp 2018 and hope to see you there! 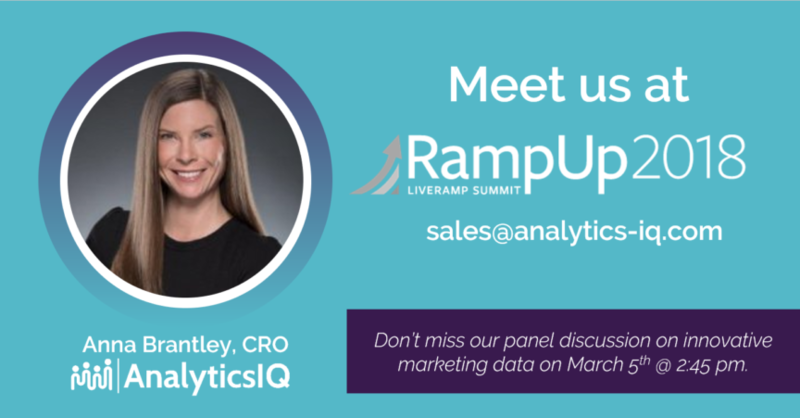 LiveRamp’s RampUp 2018 Summit is right around the corner, and AnalyticsIQ could not be more excited about attending and participating in the conference again this year! RampUp is one of the most worthwhile, annual events for anyone involved with the world of martech and digital advertising, and this year looks to be no exception. Industry leaders from brands like American Express, Trip Advisor, and CNN will be covering topics like data’s influence on the creative process, people-based TV marketing, and consumer privacy, so you’re sure to learn something new. And with nearly 2,500 diverse attendees, there are plenty of opportunities to make new connections. AnalyticsIQ’s CEO Dave Kelly, COO Mike Hattub, and CRO Anna Brantley will be in attendance along with a several other members of our team, and we’d love to meet you while in San Francisco! Also, while you’re there, don’t miss Anna Brantely’s panel discussion at 2:45pm PT on Monday March 5th in the Gold Room. Anna and several other data providers will participate in a session called ‘A data innovators discussion: The Data Store’. They will discuss their experience as active members of LiveRamp’s Data Innovators program and the value the program’s unique data can offer advertisers. Will you be at RampUp? Click here and let us know – we’d love to meet you in person!